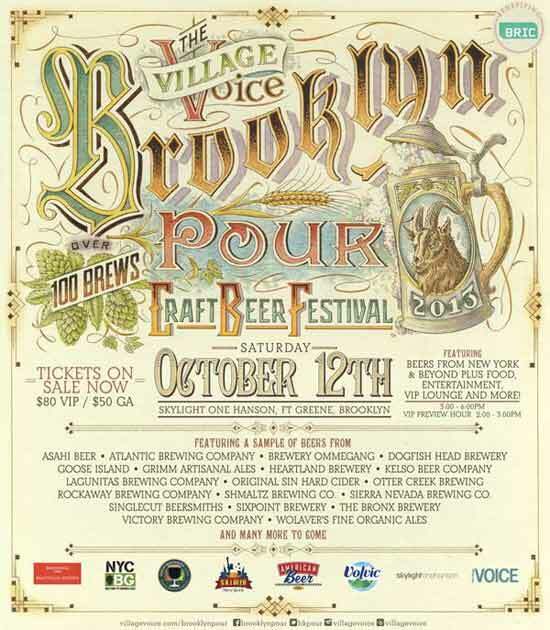 The Village Voice’s third annual curated Brooklyn Pour craft beer tasting event will take place on Saturday, October 12th. The festival will return to Fort Greene, Brooklyn at Skylight One Hanson, and feature over 100+ craft brews from New York and beyond. General admission is from 3:00pm to 6:00pm with a VIP-only preview hour from 2:00pm to 3:00pm. Sample the best seasonal, micro and reserve brews from breweries around the country. There will be demonstrations, meet & greets, beer talks, entertainment, food court and more. There will be an exclusive Brooklyn Pour photo booth too. Participating brewers include Brewery Ommegang, Dogfish Head Brewery, Goose Island, Grimm Artisanal Ales, Heartland Brewery, KelSo Beer Company, Lagunitas Brewing Company, Original Sin Hard Cider, Otter Creek Brewing, Rockaway Brewing Company, Shmaltz Brewing Co., Sierra Nevada Brewing Co., Singlecut Beersmiths, Sixpoint Brewery, The Atlantic Brewing Company, The Bronx Brewery, Victory Brewing Company, Wolaver’s Fine Organic Ales and there are many more to come! General admission tickets are $50 and VIP tickets are $80. All ticket holders get unlimited tasting of the beers and receive a souvenir glass. VIP guests gets early admission along with access to a VIP lounge with a private bar, complimentary food, and a VIP Gift Bag. Tickets are available now. Proceeds from Brooklyn Pour ticket sales are going to support BRIC, a nonprofit organization that has been the driving force behind a number of Brooklyn’s most widely renowned and beloved arts and media programs.